If you do writing prompts regularly for about six months you will find that you have amassed a considerable number of pages. Take some time to read them all. You will see that you have developed a body of work that is unique to you. You might see patterns in your thoughts or in your style. You will like some things better than others. You might even find things that you don’t even remember writing. 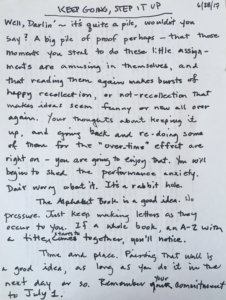 Write yourself a friendly pep talk about your writing practice. Remind yourself of what you are doing right. Explain what the best parts are. Give yourself some honest encouragement for continuing. Here is a more detailed version of these directions.